Mamas-- you know that we review quite a few items, and I have loved tons of things that I have reviewed over the past year. This product, however, has completely blown my mind! You know when you see a product and you think, "Too good to be true?" This is one of those products, and I promise it works 100%!!! 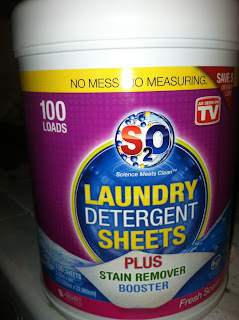 I am beyond thrilled that I got to review S20 Laundry Sheets and love that I can share them with you. 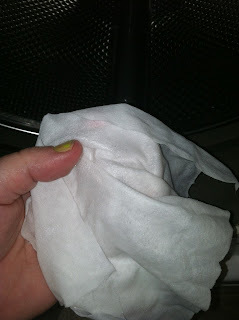 Ok, I will admit, I vaguely remember someone mentioning laundry sheets to me. I just passed it off as dryer sheets, and never thought of it again. Even when the box arrived, I looked a them, thought they were dryer sheets, and put them in the laundry room until I was ready to review. And on review day, I opened the package, and really looked at them, and shouted to my husband, "These are WASHER sheets AND dryer sheets!" Needless to say, things like this excite me! How! How do I end up with to much laundry. The kids get dressed in the morning. Then, the decide to go swimming or run through the sprinkler. Then, they put new clothes on. That is 2 outfits for 3 kids plus their pajamas. That is assuming they did not spill anything on themselves, which would mean more laundry. PLUS my 3 year old has reached an independent stage, and she tries on MULTIPLE outfits a day (today was thankfully only 4, yesterday was 7-- but at least she puts them in the hamper?????). So, what everyone is wondering is, do they work. Oh my word! They do! They do! You take 2 sheets (1 for a lighter load) throw them in your washer, and run the wash. You put the laundry into the dryer with the sheets and they work as a dryer sheet as well. You can even use them on stains as a stain remover. They are detergent, stain booster, and fabric softener-- ALL IN ONE!!!! One product!!! AND there is NOT mess from pouring a liquid!!!! 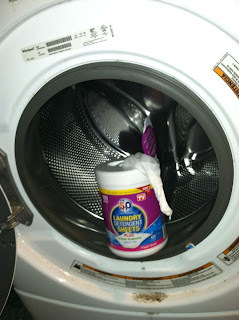 The smell of my laundry is amazing, and they work on both front load and top load washers!!!! Next stop-- showing my 10 year old so she can do the laundry!!!! Wahoo!!!! !